Two years in home warranty. Corrosion resistant components to ensure unit longevity and durability. Power cord included for ease of plug-in and powering on/off the unit. Continuous feed means you can push more waste into the disposal quickly and thereby dispose of it rapidly. Works with your septic tank so it allows you to create less garbage. The unit has a motor that produces 2600 RPMs and its high speed to ensure accurate and adequate grinding power. If you require a small unit because you have really limited space underneath your sink, the compact design of this unit makes it a great choice. The splash guard on the device is removable for ease of cleaning. In terms of size, it only weighs nine pounds and measures 6.4” x 6’4” x 13.4” so it will fit under many kitchen sink or faucet setups. The Waste King Legend Series L-1001 promises you quiet operation since the device is insulated. You’ll also get the minimal vibration of the unit when the EZ Mount is tightly connected to the bottom portion of the sink. The unit does not shake loose, operates smoothly, and remains quiet when in operation except for when you are grinding things like fruit pits or small bones. The included splash guard also helps to keep noise production to a minimum. 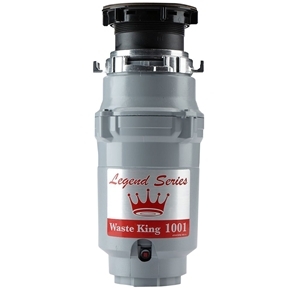 When using the Waste King Legend 1001, you are using a disposer fitted with durable, corrosion-proof parts. The food waste disposer has an anti-jam swivel impeller made of stainless steel. When the disposer grinds food waste, it will slow down a bit. When the unit slows, it is actually increasing torque at that time, in order to grind up the more difficult food waste. The impellers are attached to a spinning plate. The plate will continuously force the waste to move against a stainless steel grind ring: This is how the Waste King breaks down food. If you follow the instruction manual and use the EZ Mount features, the Waste King L-1001 takes under an hour to install. Compact design makes it fit easily under the sink. The unit is easy to clean and maintain. The two year in home warranty allows you to buy in confidence. The disposer has enough power to grind out most food waste, including things like celery, potato peels, fruit pits, and small bones. The unit does not come with a wrench to help clear any jams that may occur. The garbage disposer comes with a chrome flange (the part that connects the unit to the bottom of your sink). If you have a stainless steel sink and faucet/handles, it makes it more difficult to match up the colors of the metal. Read the installation manual before you start to install the device. Gather all the tools you will need to install the unit before you begin. The tools you need are listed in the installation guide. It is a good idea to invest in some plumber’s putty or tape to avoid leaks. You can apply it to connections to help in preventing leaks in the future. You will need an outlet near the unit to plug it in: This disposer has an outlet about 6.5 inches below the bottom of your sink. Do not use a harsh cleaner with the disposer: The unit cleans itself each time you use it. The Waste King Legend Series L-1001’s 1/2 HP motor, durable impeller, and non-corrosive parts ensure the long-lasting potential of this garbage disposer. While the installation may prove cumbersome with someone with limited plumbing experience, the unit is still an attractive disposer option once you install it. The affordability of the device makes it perfect if you happen to be budget conscious. The two-year in-home warranty allows you to have greater confidence when you decide to buy the food waste disposer. Finally, its compact design is another attractive feature, as are the noise reduction features. We hope you find our Waste King L-1001 review useful.